Live Chat: Question about a product? 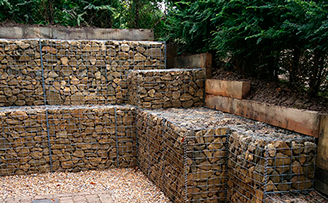 gabion basket 3m x 2m x .3 or .225m 3 X 3 3.0 Galfan Coated (95% Zinc 5% Aluminium for up to 4 times the life of a galvanised finish) PVC coated to an over all diameter or 3.22mm, average coating thickness is no less than 0.25mm, PVC coating is compound UV stabilized as per ISO4892-2. 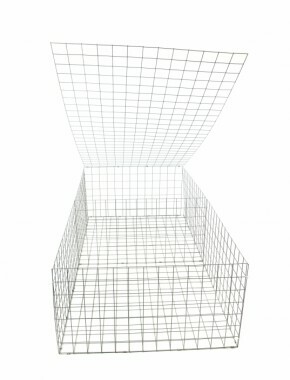 All mesh panels used to produce our baskets are European source Can be used for gabion basket, garden garden. 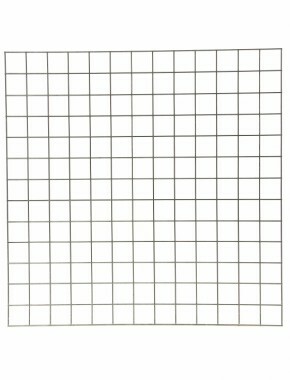 Our Customers recent projects and ideas: View All. 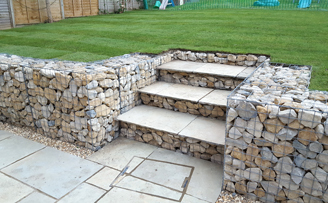 Retained sloping back garden and gabion steps. 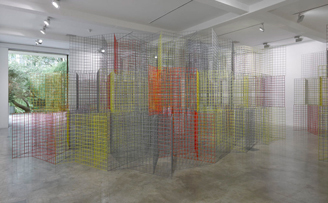 Rana Begum: The Space between. Art exhibition at the Parasol unit, foundation for contemporary art. 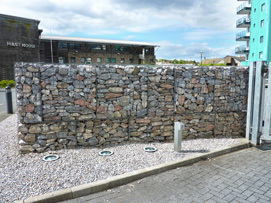 Gabion used as a perimeter wall for an apartment complex car park. 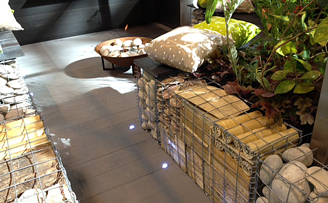 The gabion baskets are used as an architectural feature with uplights. Reclaimed lawn and managed stream course. Slipping Burn endagering property, Avid Gardener. 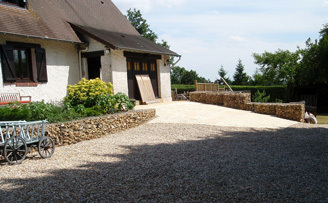 Gabion drive in Normandy France. 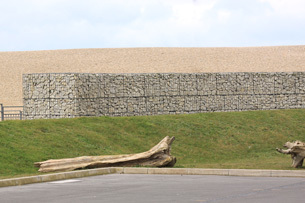 Examples of gabions we've seen dotted about the country. Click through to see many more examples. 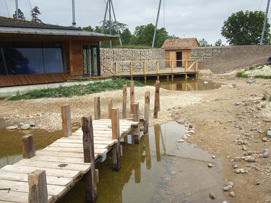 These are gabion baskets installed by Rock and Water for a project at Twycross zoo. 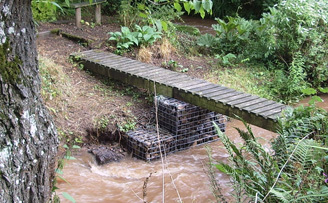 This bridge has been swept away by floodwater four times now and each time we have been able to retrieve the bridge downstream so with the help of your gabions it will not be going anywhere in the future. 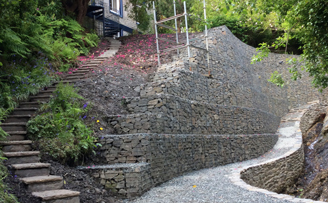 "Image of wall – client wanted a very contemporary look to a small back garden space – gabion baskets and white cobbles gave just the right look. 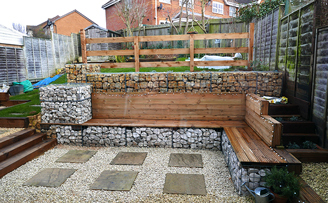 Image of seat – client wanted an unusual seat for a front garden space to sit and read books. 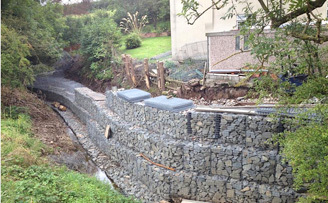 Gabion baskets were the answer." Ellen' retaining wall and driveway. 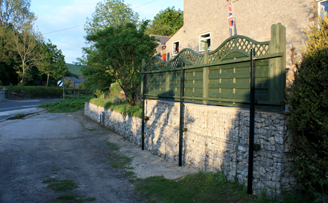 An example of a very good install of a retaining wall fence and driveway. 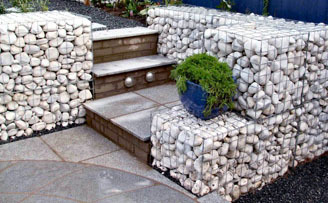 Narrow gabions planters. Perfect for making vegetabke or flower beds. 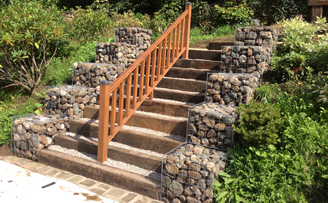 Stairwell using, gabion baskets and sleepers. 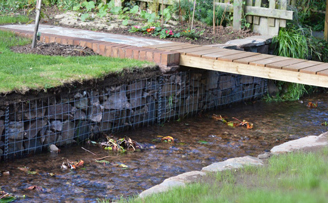 Protecting your property from river erosion.